New Calrad 55-866-10 DB15-HD to 5 BNC's Shielded 10 Foot Adapter Cable. RGB video + Sync. TWO New ADC 6.5' Length MG6V Green Mini WECO (Mid Size) 75 Ohm Video Cables. Savina Minimax Dense Fine Filament Wiping Cloth, DA-88, Video Head Drums, Etc. "24"" ADC B2VX 1244432 Standard Mid Size Blue 75 Ohm Analog Video Patch Cable. VS"
"24"" ADC B2VX 1244432 Standard Mid Size Blue 75 Ohm Analog Video Patch Cord Cable. " 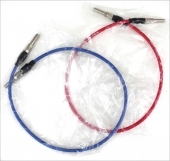 TWO New ADC 2.5' Length MR2VX RED AND BLUE Mini WECO (Mid Size) 75 Ohm Video Cables. 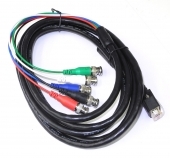 New Premium U.S. Made 15' DVI Cable, Low Attenuation, Metal Connector Shells. 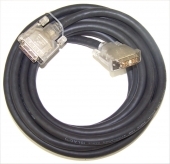 New Premium US Made male to male 15 foot DVI Cable, Low Attenuation, All Metal Connector Shells, manufactured by Total technologies. Two component video cables / snakes. 15' RGB RCA-RCA snake, very flexible, great condition, made by Calrad. For sale is a Sony Sony 3-735-707-01 Motor Assembly for the Sony SLV-20, SLV-X4, SLV-X200, and SVO-1410 pro video recorders.